A bunch of archeologists who investigate discoveries made during construction soon arrived, and the wood began to deteriorate upon making contact with the air. It seems the bottom of the hull had been severed from the rest of the ship and used for landfill. Also found were an old shoe and a large metal collar that was possibly part of an oven. Construction workers continued to dig even while the ships remains were being excavated nearby, so if any 18th century sea-faring ghosts do show up any time soon, at least we’ll know about it. It was hoped the artefact could be retrieved by the end of today, said archaeologist Molly McDonald. A boat specialist was going to the Ground Zero site to examine the find. “We’re mostly clearing it by hand because it’s fragile,” she said. Construction equipment may be used later in the process. McDonald and Michael Pappalardo, an archaeologist, were at the site of the 11 September 2001 attacks when the hull was discovered on Tuesday morning. The imagination runs wild with thoughts of what events transpired to bring this ship to rest in this spot beneath Manhattan. Was it shipwrecked in a terrible storm? Could there be gold in there somewhere? Something to do with pirates? How did it get so far underground? Did eighteenth-century mole people live inside it? So many mysteries! 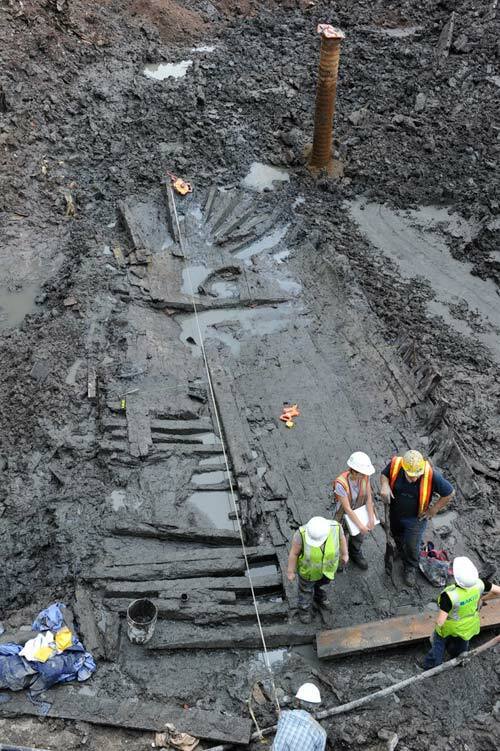 About the farthest [archaeologists] Mr. Mackey and Mr. Pappalardo would go in conjecture was to say that the sawed-off beams seemed to indicate that the hull had deliberately been truncated, most likely to be used as landfill material. A 1797 map shows that the excavation site is close to where Lindsey’s Wharf and Lake’s Wharf once projected into the Hudson. But enough about the process, what do we know about this giant boat sitting under the city? While 30 feet of hull were uncovered in the excavation, estimates place the length of the entire ship at two or three times that much. It also appears that the ship may have been rather unloved, possibly torn apart on purpose to be used for landfill. Poor ship. Workers are excavating the World Trade Center site (Not done yet? What is this, union labor? ), and on Tuesday, they found a giant 18th-century ship stuck in there. How? Well, back then terrorists were called “pirates.” (Evil liberal Hollywood has made empathize with pirates, but they were TERRORISTS OF THE SEAS.) And these pirates hated nothing more than our freedom (for white English male property owners)! 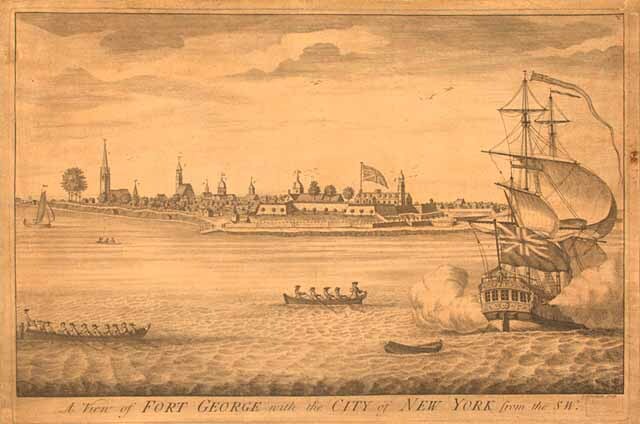 So they drove their ship up Manhattan and right into the side of the Dutch East Indian Company Worlde Trade Centre. Is that the only explanation? Perhaps the 9/11 terrorists brought a giant old ship with them on the planes they hijacked. They used to let you bring anything on an airplane. Anyway, freedom is never free, even in colonial times, as we see here. And pirates are scum. A second ship hasn’t been found, so we can assume some patriots took their ship back from the pirate hijackers and rammed it into the middle of William Penn’s colony. Archaeologists dug up this ship and now will probably want the government to pay them for the ye olde aesethma they contracted.